Fueled by an inevitable transformation of our transportation system, the Safe-D UTC endeavors to maximize the potential safety benefits of disruptive technologies through targeted research that addresses the most pressing transportation safety questions. We have identified four potential disruptive technologies, including connected vehicles, automated vehicles, transportation as a service, and big data analytics.The Safe-D UTC was awarded in November 2016 by the U.S. Department of Transportation as a highly competitive national UTC grant. The national grant entails a planned $2.8 million each year in federal funding for five years, matched by an equal amount of cost-share funds from university, state, and private sources. 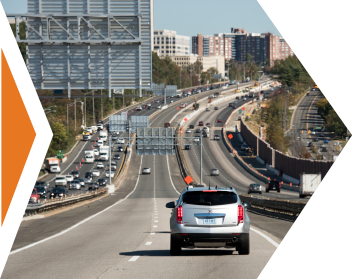 The nation’s top safety researchers will perform work under the center while leveraging existing and upcoming world-class research facilities across the universities, such as the Virginia Automated and Connected Corridors, the Virginia Smart Road, and the Automation Park, all of which will collectively enable robust real-world testing of automated and connected vehicles. Connected-vehicle technology facilitates a system in which vehicles, infrastructure, and other devices communicate wirelessly to alert the traveling public of such challenges as impending collisions, congestion, roadway hazards, and inclement weather. The Safe-D UTC will help further guide national standards and policies in relation to the successful implementation of connected-vehicle technology in anticipation of realizing its goal of reducing up to 80% of non-impaired crashes and serving as a strong foundation for the advancement of automated-vehicle technology. Automated vehicles are coming online at a rapid pace, with federal agencies releasing multiple statements and policies in response to the increased pace of automated-vehicle development. There are many potential advantages to the use of automated vehicles, from fewer traffic collisions to increased accessibility. However, numerous research questions will impede performance and possibly lead to undesired outcomes if left unanswered. The Safe-D UTC is responding with targeted research projects led by the industry’s top experts, along with their students, to prepare the technology and the workforce for the arrival of automated vehicles. Transportation planning is increasingly focused on enabling users to seamlessly travel using various modes of transportation, such as walking, biking, and driving, thus enabling ubiquitous mobility and eliminating the need for personal vehicle ownership. With a growing strain placed on surface transportation due to continued population growth, longer lifespans, increased freight movement, and emerging megaregions, the Safe-D UTC will be dedicated to addressing and mitigating national issues quickly bearing down on the U.S. transportation system by acquiring the knowledge necessary to ensure effective service models across the system. The application of “big data” is intrinsic to improved transportation and can help address an infinite number of safety-related questions, from pinpointing facilities that need improvements to support vulnerable road users and multimodal transportation service models to creating better ways to serve Strategic Highway Safety Plans and making real-time decisions that maximize network safety. The Safe-D UTC is committed to assembling large-scale databases and world-class analytics with the aim of maximizing value for traditional and novel transportation data sources.